The easiest slow cooker pork carnitas recipe that is full of flavor and cooks all day to tender and juicy perfection! 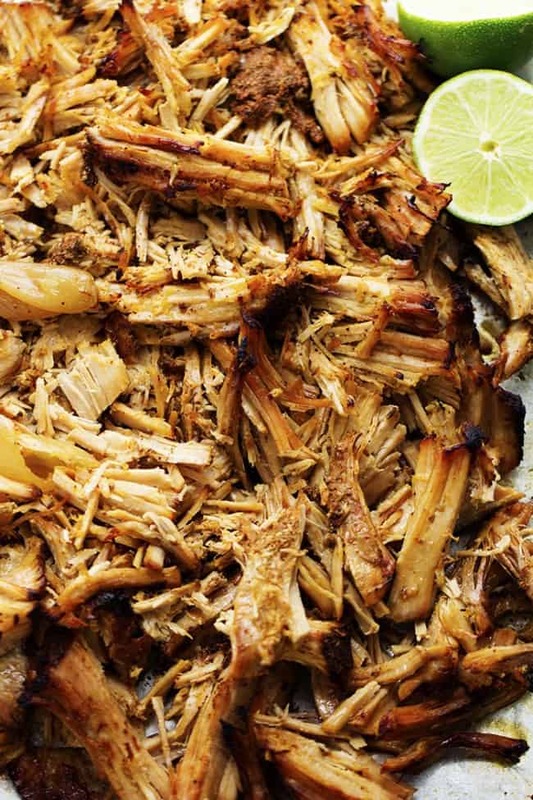 A carnitas recipe that you will make again and again! If you have been following the blog then it is no secret that I love my slow cooker. Most of my favorite recipes here on the blog are cooked in the slow cooker. It is so nice as a busy mom to just throw something in the slow cooker and let it do its thing. Then when dinner time rolls around you have an amazing meal ready. 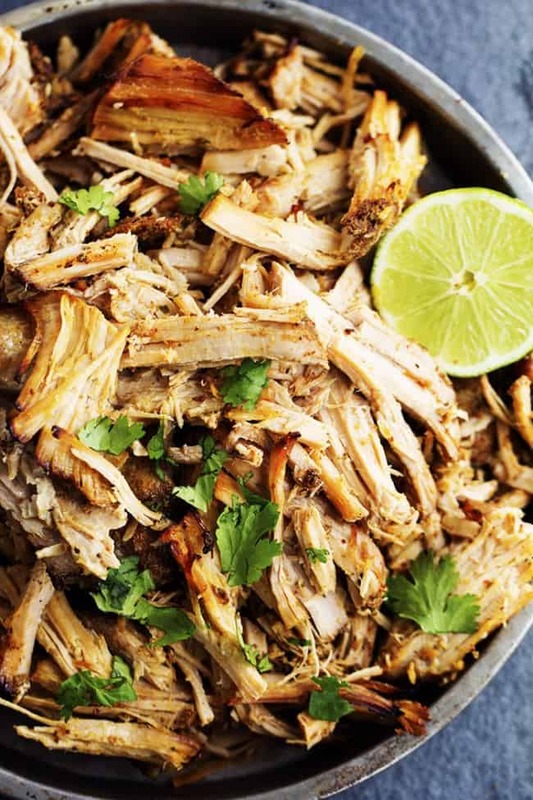 Well I am here to tell you today that I found one of my favorite slow cooker pork recipes. It slow cooks for eight hours in a spice rub and a citrus marinade and the flavor is out of this world! The outside edges get crisp and the inside is melt in your mouth tender. The pork comes out of the slow cooker and just falls apart it is so tender. You can either eat the pork right out of the slow cooker or broil it in the oven to give it a crisp edge. It is so versatile and can be used in tacos, burritos, quesadillas, you name it. It will add delicious flavor and taste to whatever you use it for. I know that this recipe will become a family favorite and you will use it again and again! 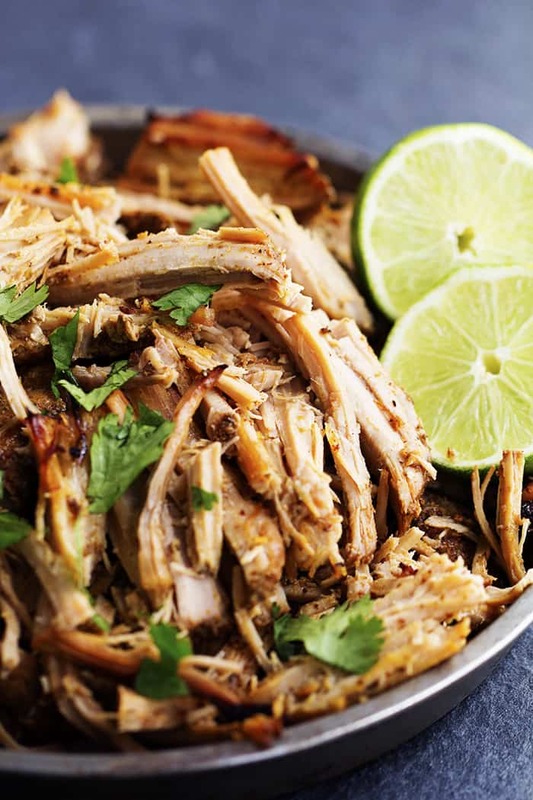 The easiest slow cooker pork carnitas recipe that is full of flavor and cooks all day to tender and juicy perfection! A recipe that you will make again and again! In a small bowl combine chili powder, cumin, oregano, salt, and pepper. Rub on the outside of the pork shoulder rub thoroughly. In the slow cooker, combine orange juice, lime juice, garlic and onion. Place pork on the top. Cook on low for 8 hours or high 4-5 hours. Remove roast from slow cooker and shred. Return to slow cooker and heat for an additional 30 minutes. Remove the pork from the slow cooker and place on a baking sheet. Broil in the oven for 3-4 minutes to brown the edges of the pork. This recipe sounds wonderful! I just wanted to let you know that the entire recipe does not come up when I click on the print button. I was able to highlight and print though. Thank you for all of your wonderful recipes! made it tonight! Amazing! Broiling at the end was key!! Amazing flavor. Server with charred corn tortillas, queso alfresco, cilantro, avocado, and and lime. Perfect!! Do you use boneless? Bone-in? Keep the rind on? Rindless? If on, scored? doesbkt go back in after the broiler? is this really orange tasting? i’m not a huge fan of orange juice but this recipe sounds amazing. or do you have a recommendation for a substitution? It wasn’t too spicy at all. It slow cooks all day in the juices and I feel like all of the spices are needed to maintain the flavor. I know it wouldn’t be as authentic but could you substitute the lime with lemon juice? do you think it would effect the taste in a negative way? This was delicious! Everyone in our family enjoyed it. This was fabulous! The spices are perfect, and broiling adds the perfect finishing touch. Many thanks! This is remarkably close to what is served at our favorite (authentic) Mexican restaurant. The seasonings are subtle but really yummy. And the final step of broiling the meat shouldn’t be skipped. Awesome!! Great recipe but not close to authentic tasting. Adjusted the spices and got it a little bit closer. After shredding, we tasted and that’s when the spices were adjusted. Added a little bit more OJ, Cumin and the extras we added were a few dashes of Cayenne and Chipotle Chili Pepper powder. Now we’re talkin’! 🙂 Thanks for a great new recipe! Served with toasted corn tortillas, pico de gallo, roasted tomatillo sauce and shredded cabbage. Thanks for your feedback! I will have to try it that way! Do you think it would be okay on low for 10 hours? Should I add more fluids? It creates a lot of its own juices as it cooks. I think it will be ok! What are the instructions for broiling? Temperature? after you broil it do you leave it out or put back in juices? Put it back into the juices. It’s in my crockpot right now!! After I quartered the onion, I pulled apart the onion, so the meat is sitting on top of the onions. Is that okay? Or should it be sitting in the juice? Thanks for the recipe!! I just made this tonight. OMG DELICOUS!! My whole family loved it!! This was so delicious, made it a few weeks ago and making it again right now! Can’t wait to eat it again. The flavors are so good with corn tortillas and I made a nice little cabbage slaw to top it as well. Could you substitute broth or clementine juice for the OJ? I am allergic to Oranges, but this recipe sounds delicious. I have pork chops in the freezer….do you think it would be okay to use those instead of a roast? I’m new to using a slow cooker, if O use them would I adjust the cook time? Would I be able to just use regular orange juice? So my fiance and I are planning on serving pork carnitas at our reception/ party weekend on the lake. I’ve never made carnitas before. We’re planning on making them ahead so would you recommend that we do all steps including broil and freeze vs. freeze after crock pot, and broil the day of reception and throw back in crock pot? Thank you! Anxious to try! My family loved this meal!!! My teenage son actually didn’t get up and leave right after he ate. He stayed and continue to eat more after every else was done!! I don’t eat pork, but was wondering if this recipe can be used with chicken? Can i use pirk loin instead of shoulder? I have to give credit where credit is due- I already commented on how my son loved these carnitas. This weekend I made them again for my party of 30. I made 25 lbs of meat. ( I borrowed friend’s crockpots) Everyone couldn’t stop raving about it. My friend’s husbands were asking if they can take some home! I didn’t want to share your recipe, but I did. Now everyone will be making it:) thanks again for the great recipe! Has anyone ever tried this in the Instant Pot? If so, was it good? How long? Thanks! We doubled this recipe for a potluck and it was a huge success! I was concerned it would dry out because it was going to be sitting out, so after putting the meat in the oven I reduced the liquid from the crockpot instead of throwing it away. After skimming the fat off the top, we chopped up the onions in the broth and mixed the onions and some of the broth into the pork. This kept the meat beautifully moist and tender! We also mixed in some chipotle chili powder to add just a bit of smoky heat to the flavor profile– 1 teaspoon to the doubled recipe added just enough without overpowering the citrus. I’ve already shared the website with everyone. Thanks! PS I cooked rice and beans and added the final bit of crockpot liquid to it, AWESOME.